This research study reconstructs several design and production stories from Dutch television in which pixels and PAL first made contact in the early 1980s, in the context of a broadcasting system in transition. The paper is based on the analysis of station calls and title sequences that are preserved in audiovisual archives and by private collectors, on interviews with key figures and on the examination of articles featured in specialised magazines of that time. These design stories illustrate the different approaches of designers and broadcasting organisations to the computer and the role of the computer in audiovisual design. Early adopter Veronica chose to simply copy American examples. Designers like Willem van den Berg and Carlo Delbosq tried to find more meaningful uses and navigated between high-tech and low-tech, large and smaller budgets, explicit and subtle visual references to the computer. The peculiarities of the Dutch media landscape and the changes this landscape underwent strongly informed the various approaches to computer-aided design. The early 1980s saw a rapid succession of new digital hard- and software for the design and production of motion graphics. This technological development coincided with two transitions in Dutch media history. First, the public broadcasting system opened up to new broadcasters and this resulted in increased competition for audiences. Second, the state monopoly on television production facilities developed into a free market. How were new technologies used within this context? And what kind of designs emerged? This research study analyses the design and production story of four cases of motion graphic design – one station call and three title sequences – made for four different public broadcasters. These stories illustrate the diverse approaches and attitudes of designers and broadcasting organisations towards the new technologies that were then available. Some embraced the computer as both a design tool and a stylistic inspiration, others were instead skeptical. Would the computer replace the designer? And were the results of computer-aided design worth the substantial investments? When the computer made its appearance in the intricate Dutch broadcasting system the latter was experiencing turbulent times. The Dutch public broadcasting system was conceived in the 1920s, a time when Dutch society was characterised by so-called pillarisation, i.e. a segregation of society where each “pillar” has its own institutions, ranging from political parties to sports clubs. Pillarisation shaped the unique Dutch public broadcasting system (Van Vree, 1994, pp. 23-24). Broadcasting time on radio and, from 1951 onward, on television was assigned by the Dutch government to five broadcasting organisations: KRO for catholics, NCRV for protestants, VARA for socialists and AVRO and VPRO for the remaining neutral or liberal groups. The organisations had paying members from the corresponding pillars. AVRO, KRO, NCRV and VARA each had equal shares of broadcasting time, but VPRO, having substantially fewer members, was allocated a smaller portion. The production facilities for radio and television were provided by a state-owned and publicly funded foundation called NOS (which, as we will see in paragraph 4, also had an obligation to broadcast news and major sporting events). Each broadcaster was allocated a part of the available budgets, studio time, manpower, and so on. Similar to the way the broadcasting time was divided, the four major broadcasters were allocated a larger share than the smaller VPRO (Bank, 1994, p. 84). In the mid-1960s pillarisation began to disintegrate due to secularisation, economic prosperity and the emergence of youth culture (Van Vree, 1994, pp. 36-37). One of the consequences was that the the public broadcasting system opened up to new organisations in 1965. Any organisation that reached a certain threshold of paying members, and thus proved to represent a distinctive group in society, could get broadcasting time on the public channels and a share of the public production facilities. While the original five organizations were losing members because of depillarisation, TROS, the first new broadcasting organisation to enter the system in 1966, successfully adopted a commercial approach, quickly attracting new members. This led to a period of competition between public broadcasters for members (Manschot, 1994, p. 189). In turn, this competition affected the television production sector. The public broadcasting organisations felt that they could compete better if they were free to choose their production facilities in a free market. In the early 1980s the monopoly of the state-owned television production company NOS was broken up and the production industry gradually transformed into a free market. Many new companies emerged just as the computer and other digital developments were introduced in the broadcasting industry. Therefore, it is safe to say that the computer entered the Dutch broadcasting system in turbulent times. Veronica was one of the new organisations that were admitted into the public broadcasting system. 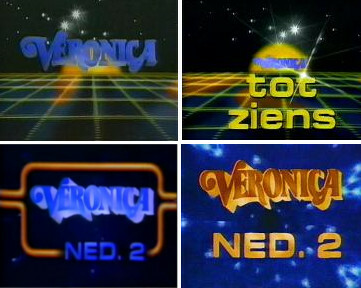 Originally an illegal radio broadcaster (since 1959) with a commercial attitude – for instance, they were the first Dutch radio broadcaster to use jingles – Veronica was popular among the youthful demographic and in 1975 it had gathered enough members to warrant television (and legal radio) broadcasting time and services from NOS. When Veronica ventured into television, they introduced a new logo: the name of the broadcaster is composed of blue letters drawn as thick three-dimensional objects. The letters are set in a classic Roman type with curly ornaments that resemble musical notation (clefs, flags and rests) – a reference to Veronica’s origins as a radio station. (Despite our efforts, we could not identify the logo’s designer.) Veronica filled its broadcasting hours on the public channels with inexpensive productions, like infotainment, talk shows as well as imported American series such as Dynasty, Miami Vice and Starsky & Hutch (Manschot, 1994, p. 189). Just as for their programming strategy, Veronica also looked to the United States when it came to designing their station calls, programme announcements, title sequences and other visual identity elements. As early as the 1960s the American film industry had demonstrated the amazing possibilities of computer-aided motion design and animation. Stanley Kubrick’s 2001: A Space Odyssey (1968) had an incredible impact when it came to thinking about the computer’s role in science and design. In the following years, films like Star Wars (George Lucas, 1977) and Tron (Steven Lisberger, 1982) as well as arcade games further popularised a new digital aesthetic and related visual tropes. Veronica was the first Dutch broadcasting organisation to key into this style. Figure 1 and 2 show stills from the station identity packages that were used in television season 1981-1982 and season 1982-1984 respectively. Because not all of the elements of these Veronica identity packages are available, we concentrate on a closing call from 1982-1983 as seen in figure 2. In this station call Veronica’s logo is presented as a spaceship that travels over a digital planet. The shimmering blue logo enters the screen from the top and then hovers above a dark floor with yellow lines. The grid over which the logo flies is a visual trope for the computer’s interior that is often found in popular science-fiction films and series of the period – such as the aforementioned Tron. In a more literal sense, the grid pattern recalls the wireframe modelling typical of 3D computer graphics – i.e. the representation of an object that shows the underlying structure of an object. The role of computers in space explorations and the role of computers in creating special effects for science-fiction films in the previous two decades, intertwined space and digital space. In the early 1980s the workspace of digital design and animation was not envisioned as a white sheet of paper, but rather as a dark screen that could extend endlessly in any direction – just as space. It’s not surprising, therefore, that early computer animations feature a lot of stars, planets and shiny objects flying through dark surroundings. As to Veronica’s station calls, we could say that the references to the grid and to space did not serve to associate the broadcaster with space exploration, but with computer technology and it’s associations with progress, youth and speed. However, at that time computer animation was not yet available for a small broadcaster from the Netherlands. Therefore, Veronica chose the next best thing. This closing call and the other elements of the station identity were created at Image West in Hollywood, United States, using a system called the Scanimate. The Scanimate was not a digital machine, but rather a room full of analogue video equipment. It could capture (scan) original artwork – like an airbrushed Veronica logo or a grid pattern – on video and manipulate these images by turning and twisting a large variety of knobs and sliders. This machine was conceived by Lee Harrison III and about eight of them were in operation at different companies around the world. A few of the special effects in the first Star Wars film in 1977 were created with a Scanimate, but most clients came from the television industry (Sieg, 1998). David Sieg, who worked as a Scanimate operator and now runs the Scanimate museum and website, explains the production process at Image West: “Clients could bring in a logo, have it animated, interact with the animator programming the Scanimate, get exactly what they wanted, and walk out a few hours later with a finished product ready for air” (Sieg, 1998). Scanimate showreels reveal, though, that not all output was original: they include several other logos hovering over the exact same grid and starry horizon that was used for the Veronica station calls. Colombian television station RTI, for instance, used station calls with this background from 1979 until 1990. In this light, it might sound surprising that Veronica is said to have spent fl.175.000 (that would be the equivalent of €150.000 today) on this package (Dekker, 1982, p. 19). That was a lot of money to spend on an off-the-shelf station identity. The Veronica station calls were actively disliked in the broadcast design community. Willem van den Berg, a motion graphic designer who worked for VPRO at the time, voiced his dislike to a reporter from a specialised magazine addressing film and television professionals: “What Veronica makes is derogatory; they are still in the radio era, as long as it is loud, as long as it is thumping. I can see many horrific spots that must have required a lot of energy to make, but where function and form are completely unconnected” (Dekker, 1982, 19). Van den Berg also mentioned the price issue to the reporter and was quick to point out that those means did not justify the end. As a tax payer Van den Berg had every right to scrutinise the expenses of a public broadcaster. As a designer he had even more reasons for disliking what Veronica was doing. That Veronica favoured working with modern technology over working with a designer evoked visions of a future where designers would be replaced by computers. Van den Berg’s main objection, however, seemed to be the lack of quality and content. While a pioneering multimedia artist like Ron Hays used the Scanimate to produce interesting experimental music films, the bulk of the scanimation work – as the operators themselves acknowledged – was poor quality. Dave Holman, who worked as a Scanimate operator in the 1970-80s, recalls for instance that “ninety percent of it was crud flying logos, sleazoid auto dealers’ ideas of showing their superiority over other sleazoid auto dealers, and suchlike” (Holman, n.d., n.p.) It is quite clear that Van den Berg considered the Veronica station calls to be part of that ninety percent. However to fully understand his judgement of Veronica’s flying logo one must look into his background and his work at VPRO. At the time when Van den Berg criticised Veronica’s flying logo, he was the in-house designer at VPRO, the smallest organisation in the previously pillarised Dutch broadcasting system. They had never objected to this position, but in the early 1980s their small size meant that their position and significance within the broadcasting system was at risk. In the 1950s they were the smallest in a group of only five, but by 1980 three new broadcasting organisations had entered the system and kept growing in terms of members. Consequently, broadcasting hours were spread ever thinner and membership thresholds were raised. VPRO felt the need to reaffirm their position within the system. Unlike most other broadcasters however, VPRO decided against using light genres and entertainment to lure viewers i.e. potential members (Manschot, 1994, p. 189). Instead, they kept their focus on highbrow genres and topics, like avant-garde art, science and documentary film. In the late 1960s VPRO had been at the forefront of progressive youth culture and now in the early eighties they decided to aim at a new generation of youngsters, the same demographic that Veronica was courting. VPRO and Veronica were both fascinated by American popular culture, but they expressed this fascination differently. VPRO always approached American culture from a certain perspective. Whereas Veronica simply screened a popular American science-fiction film, VPRO would create a thematic evening about the history of the genre. Whereas Veronica aired popular American soaps, VPRO’s documentary film makers travelled to the United States to critically examine typical American phenomena (Hogenkamp, 2015, p. 29). In regard to youth culture Veronica’s music programmes featured mainstream pop and disco, whereas VPRO’s were focussed on avant-garde and underground subcultures like punk and new wave. This is where young punk and art student Willem van den Berg comes into view, as he narrated to us. In the late 1970s Van den Berg and a group of young people in Rotterdam made a programme called Neon which aired on the local television network. Video did for them what the Xerox machine had done for punk (maga)zines: it democratised access to media production. Unlike celluloid film and professional video formats, consumer video equipment was easy to operate, easy to manipulate and affordable. In 1979 VPRO bought and broadcast videozine Neon. 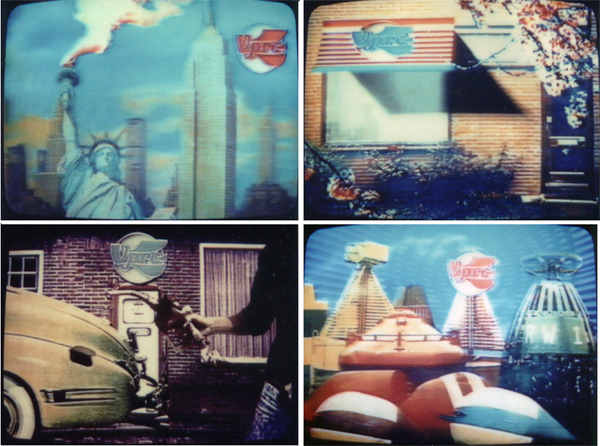 Van den Berg was asked to create advertisements that ran right after Neon, inviting viewers to become VPRO members. Shortly after that, around 1980, he was asked to become the new in-house designer at VPRO. At first Van den Berg worked with the existing logo designed by his predecessor Jaap Drupsteen in 1971. There was an interesting similarity between the logos of Veronica and VPRO, in the way they embraced ornaments and broke away from the “good” but often judged as dull modern design styles of the 1950s and 1960s. Drupsteen had meant the overdone, exaggerated swooshes of his VPRO logo as a tongue-in-cheek reference to American popular design: he used it to illustrate VPRO’s ironic, self-conscious attitude (Ruarus, 1985, p. 12). Van den Berg continued this attitude by presenting Drupsteen’s logo alternatively in typical mundane Dutch (e.g. on a suburban house) and iconic American (e.g. Statue of Liberty) surroundings (figure 3) – a sneer at VPRO’s (and the Netherlands’) position in the world. However, Van den Berg’s punk aesthetic, his preference for rawness, sharp lines and angles didn’t work well with Drupsteen’s rather plump and friendly logo. In 1982 Van den Berg was asked to design a new logo that was sharp as a knife. After that, as the material from Van den Berg’s personal archive reveals, VPRO’s broadcast design became much more punk. Van den Berg’s work was typically set against dark backgrounds, with bright colours, combined with sharp shapes and references to punk and American culture such as barbed wire, broken television screens, smoke and fire, stars and stripes and sometimes even actual punks. The way he produced VPRO’s television identity could also be described as typically punk. He worked from his own garage, using photographs, slide projectors, tinted filters, a 16mm film projector, cardboard, structured glass and a variety of household materials such as curtain rails, an ice cream maker and syrup to create projections which he then filmed from a projection screen. In the beginning, van den Berg’s decision to avoid the professional NOS facilities might have stemmed from a deliberate anti-establishment attitude, however, as he himself recalled the main motivation was practical: this low-tech, DIY production method allowed him to custom-make new station calls, programme announcements and advertisements for every weekly VPRO broadcast evening for a very modest budget. This custom made broadcast design was unique on Dutch television. All other public broadcasters had an opening call and a closing call and had their programmes introduced by an attractive female announcer, who quite literally acted as the “face of the organisation”. VPRO however, deemed the announcers outdated and 1969 their announcer was banned from the screen. From then on, only her (or his) voice was heard (Koenders et al. 2011, p. 10). 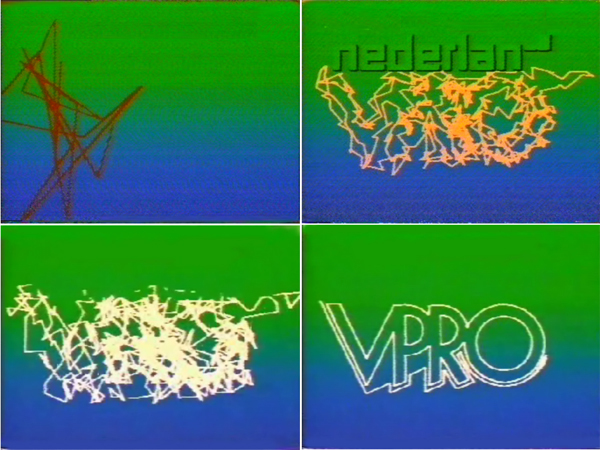 Van den Berg’s predecessor Drupsteen had started making a variety of different motion graphic sequences with his VPRO logo that ran inbetween VPRO’s programes. VPRO could choose whichever of those “signals” best suited the theme or programmes of each VPRO weekly broadcast. Van den Berg took this approach one step further and custom made new broadcasting design every week. The weekly need for new motion graphics meant that Van den Berg was always on the lookout for new inspiration. The VPRO television CEO shared and stimulated his curiosity and experiments in audiovisual design. The advertisements that Van den Berg had made and that ran after Neon were a success, VPRO managed to gain 70.000 new members in 1980. Because of this success he was afforded a larger budget allowing him to use more advanced machines at NOS or elsewhere. Van den Berg was eager to learn more about the possibilities of video editing and special effects on professional equipment and applied them wherever he could (Dekker, 1982, p. 19). In 1983, when Antics Studio introduced itself as the first digital animation studio in the Netherlands, Van den Berg was amongst the very first clients. Antics Studio Amsterdam was set up by Erick Racké and named after animation software Antics. Jules Hartogs, who was involved with Antic Studio Amsterdam right from the start and was responsible for music, sound and post-production, narrated the origins of Antics Studio to us. Racké worked as a director for television commercials when he learned about the British Alan Kitching who had programmed software for computer animation. In the 1960s graphic designer Kitching had become interested in animation after assisting Trevor Bond in creating some of his famous title sequences for James Bond films. By the early 1970s Kitching started to research the possibilities of using the computer for animation. Shortly thereafter he was invited to join a British scientific computer laboratory and there he programmed the first versions of animation software which he named Antics. With the support of the Swedish Film Institute and a Japanese computer manufacturer Kitching was able to develop Antics software into a finished product in 1982 and after that several Antics studios sprung up. Antics Studio Amsterdam was the first of those on the European mainland (Antics Workshop, n.d., n.p.). The revolutionary feature of Antics was that it was created by an animator for animators. Kitching had created software that was so easy to operate that all animators, even those who had no computer experience whatsoever, could use it. Even still, he realised that technophobia was a potential barrier. On the first and only Antics Studio Amsterdam showreel from 1985 the ease and simplicity of operating Antics is illustrated and explained. The voice-over asks: “Is talent even required with this system?” Kitching responds: “This is something you have to do yourself. Absolutively [sic] no way a machine can do it for you. And no machine can make up for a lack of creative skills”. Reaffirming that animators e.g. designers need not worry about their jobs. The requirements for the computer processor and storage system that were needed to run Antics software were substantial. Hartogs states that it took Racké approximately two years to find, finance and build the hardware environment. But even the best available machines had their limits. The resulting animation had to be rendered frame by frame and this took approximately thirty minutes before it could be recorded manually on magnetic tape. Antics software was fast and easy to operate, but the actual video output was only about two frames per hour. Even with the studio running day and night, the output was limited to just a few seconds of animation a day. Nevertheless, Hartogs remembers that Racké had high hopes for Antics and he employed several young designer who could operate the Antics system. He rented an office building in Amsterdam, which was close to the mediahub of Hilversum and potential clients from advertisement, industry and science. When Antics Studio became operational around 1984 everybody in the broadcasting industry lined up to see what Antics could do and Racké envisioned a bright future. Van den Berg went to Antics Studio Amsterdam to create a VPRO station call that was broadcast around 1984 – stills from that animation can be seen in figure 4. The VPRO logo designed by Van den Berg consisted of plain geometric elements – straight lines and circles only. He now made the most of this characteristic by cleverly assembling and disassembling the logo from a disorderly pile of scratched lines with a combination of pre-programmed Antics effects. When the logo appears, the name of the channel, Nederland 1 (public channel number 1), is written on the screen via a blinking cursor in a square, computer-like font. With Antics Van den Berg only had to design a handful of frames and the software and computer did the inbetweening; it calculated and designed the frames needed to get from one image to the next. The scratchings are in line with the sharp and somewhat angry imagery of the punk subculture and the sharpness expressed in the VPRO logo, but there’s something childish about this station call too. The bright colours may suggest that the scratchings are made not by an angry punk, but by a child. The digital tune emphasises an association with (computer) games: the ascending digital melody sounds like the kind of tune that could be heard when one reached a new level in a computer or arcade game or won something at the fun fair. The tune builds up to the visual climax where the VPRO logo becomes recognisable, suggesting that the VPRO is the reward or next level. As mentioned above, irony was a strong element of VPRO’s identity, and this station call can be regarded as a kind of self-parody, an over-the-top representation of the broadcaster as a young and modern organisation. The similarities and differences between VPRO and Veronica explain why Van den Berg was so appalled by Veronica’s station calls. Veronica was simply copying American popular styles while VPRO always chose a historical, critical or ironic distance. Van den Berg tried to adopt a similar approach in his broadcast design for VPRO. However, his aversion of the Veronica station calls did not inhibit him from experimenting with new technologies and computer-aided design. In fact, Van den Berg became an expert in this field. He gradually lost interest in working for VPRO because there were so many other clients that demanded his services. With his independent position and his accumulated skills in video and computer techniques Van den Berg became a key figure in the history of Dutch motion graphic design. As mentioned in the introduction, Dutch broadcasting organisations were obliged to use the facilities rigged for them by the state-funded production company NOS. The production process was highly regulated. A programme maker employed by one of the broadcasting organisations would submit a programme idea at NOS and was then supposed to make obligatory visits to NOS’s departments, of which the department of Graphic Design (NOS GD from now on) was one. This department designed and produced opening titles, credits and any other graphic design, animation or illustration that was requested by the programme maker. The manager of NOS GD would match the programme makers with one of the approximately 25 designers at his department. Programme makers could request a designer based on previous collaborations or specific skills, like illustration or calligraphy. Sometimes a designer who had made an impact with a certain programme or style was in high demand. Professional skills or stylistic choices were occasionally overruled by preferences that had to do with the personal and ideological background of the designers and their clients. For instance, a programme maker from the catholic broadcaster KRO might prefer to work with a catholic designer. Vice versa, a designer with strong socialistic or atheistic ideals might not enjoy illustrating stories from the Bible. The manager of NOS GD had the difficult task of weighing all these preferences and considerations, and keeping everybody satisfied. In the end, however, NOS was obliged to deliver and designers of NOS GD could not refuse assignments. Broadcasters on the other hand were able to avoid working with NOS GD, as the Veronica and VPRO cases illustrated. In some instances NOS GD – and NOS by extension – objected strongly to this and threatened to withhold all other NOS production facilities. VPRO and Veronica were condoned for opposing reasons as Willem Hillenius, chef of NOS GD from 1980 till 1984 explained to us. NOS designers admired VPRO’s avant-garde audiovisual design, so although they might have actually been eager to work for VPRO, the in-house design construction that VPRO had set up in the early seventies was tolerated (Doeswijk, 2006, p. 32; Van Vilsteren & Doeswijk, 2011, p. 237). There was no such admiration for Veronica however. Many designers disliked working for the new public broadcasters, whom they considered lowbrow and commercial. Veronica’s dodging of NOS GD was considered a lucky break. In the early 1980s this designer-client relationship was about to change as the monopoly position of NOS was called into question. Increasing competition between public broadcasting organisations for members was stretching the budgets of old and new broadcasters to their limits. The stakes were raised in terms of production value and more often broadcasters sought other – non-NOS – production facilities and financed these investments with their own revenues (Dekker, 1981, pp. 4-5). The NOS facilities were equipped with state of the art technology and a well-trained staff. Nevertheless, it was a state-owned organisation and programme makers had to contend with bureaucratic paperwork, a nine-to-five mentality amongst crew and limited flexibility when it came to last minute alterations. Broadcasting organisations experienced a much more flexible attitude from commercial production companies and argued that in a free market they would get more production value for their money. These concerns were discussed in parliament in 1981 and a decision was made in 1983. NOS was to be split up into private, commercial companies in 1988. Leading up to that the obligation of the public broadcasters to use NOS services and facilities was slowly cut back (Dekker, 1981, pp. 4-5; Ministerie van WVC, 1983). This decision affected NOS GD as well. Did the department stand a chance to exist as an autonomous design firm in a free market? There were many challenges that NOS GD manager Willem Hillenius faced. If his department was to become a commercial design firm, it could not afford to neglect possible clients like Veronica. In fact, Veronica had grown so rapidly, that other broadcasters started to copy not only their programming, but also their broadcast design. Everybody wanted their logos to shine and shimmer and float though space. But could Hillenius persuade the NOS designers to get off their high horses and cater to the needs of Veronica and the like? Most of the designers at NOS GD had been hired around 1965, when television in the Netherlands was expanding rapidly. These designers were all educated in the modernistic design tradition, they had worked in the public sector and were now suddenly confronted with broadcasting organisations with whom they had absolutely no affinity. In 1965 the designers were all in their early twenties and eager to experiment, but now they were getting on in age and had settled comfortably as civil servants with contracts for life. Moreover, the skills that were needed in the 1960s, most notably hand lettering and illustration, were over-represented in the department but rarely asked for in the early 1980s. Hillenius could not fire designers, but he also could not hire new ones because of the budget cuts at NOS that came with the prospect of privatization. His solution was to actively scout for interns at art academies and hire the most promising students afterwards on freelance contracts. Hillenius assumed that young designers would be more likely to embrace new technology and furthermore, that they would have less objections to working for broadcasters such as Veronica. Carlo Delbosq was one of the first of those interns. He told us that he started at NOS GD in 1981 and became a regular freelancer after his graduation shortly thereafter. Delbosq was interested in video and digital effects, he was eager to try new techniques. In 1984 he was asked to design a programme intro and promo for the broadcasts of the European Soccer Championship (Europese Kampioenschappen or EK in Duthc) taking place in the summer. The Netherlands didn’t qualify that year, but soccer was popular enough to spend a modest budget on a promo and opening animation. The matches were broadcast by NOS: besides providing the production facilities for broadcasting organisation, the state-owned foundation was also tasked with providing national programmes such as the daily news and major sporting events. NOS had no members, thus was not rivalling the other broadcasters and was not too concerned with visualising their own identity. The NOS sports division, broadcasting under the title Studio Sport, and Delbosq had no limitations or requests in terms of corporate identity. In 1983 Commodore had just released International Soccer, a videogame which in the early 1980s became immensely popular and which Delbosq himself enjoyed playing on his Commodore 64 – one of the best and most affordable home computers at the time. This computer game inspired him to create his first computer-aided broadcast design. Delbosq explained to us how he made this title sequence. Together with a video editor at NOS, Delbosq was able to transfer the International Soccer game play from the Commodore 64 onto the professional standard video format. This puzzled some of his colleagues who had tried and failed to do this. As it turned out, some versions of the Commodore 64 were equipped with a PAL video output channel and some versions were not, but this feature was rather obscure. Luckily Delbosq had unknowingly bought the right version. Subsequently, Delbosq and the video editor manipulated live-action footage of cheering crowds to make it look grainy and brighter so these segments would correspond better with the images from the computer game. Delbosq designed the pixellated titles on a Quantel Paintbox. The editing was done with wipes from top to bottom and from left to right and these wipes resembled the way the screen loaded in International Soccer. Figure 5 shows several stills from the resulting NOS Studio Sport title sequence for the European Soccer Competition 1984 (in the sequence shortened to EK84). Keeping in mind that this was a seasonal programme intro and not a station call, Delbosq managed to create a modern, light-hearted sequence that struck a familiar chord with an audience of soccer enthusiasts and gamers alike. And he did so relatively cheap and fast. 5. Mid Lotto Live: Lights, computer, action! Just a few months later in 1984, Delbosq’s next design project involving computer animation was much more ambitious. Allegedly this was the first 3D computer animation made for Dutch television. The client was VARA, originally the broadcaster of the socialist pillar. In the early 1980s it was an organisation in financial disarray, plagued by internal feuds and losing members rapidly (Wijfjes, 2009, p. 410). Veronica and other broadcasters, with their emphasis on entertainment, had snatched away many VARA members. VARA was in the process of reinventing its identity. Should it stick to its original aim of “educating the masses” or should it follow Veronica’s lead and “entertain the masses”? In the competition for members that had been spurred by opening up the public broadcasting system, lotto shows were the trump cards (Manschot, 1994, p. 192). Since the broadcasters (except VPRO and some of the smaller new broadcasters like Veronica) were allocated the same quota of production services and facilities at NOS it was difficult to outshine eachother. Additional production costs had to be financed by the broadcasting organisation themselves, as sponsoring was not allowed by Dutch media-law. Collaboration with charities, however, was allowed. In the Netherlands the national lotteries are charities, and as far a charities go, they made considerable revenue. Almost all broadcasting organisations sought a collaboration with a lottery, the additional budget the lottos provided was spend on extravagant sets, international artists and big prices for contestants. Thus the public broadcasters got caught up in a rat race of lotto shows. The two show with the biggest budget, and consequently the most viewers (i.e. potential new members) at the time were from KRO and VARA. KRO’s 1-2-3 show relied very much on extravagant set design. Each episode came from a completely new and very costly studio set. For instance, for one episode KRO built an Amsterdam scene with a bridge, several houses and a frozen canal on which could be skated in the studio. VARA’s lotto show was called Sterrenshow. Its unique selling point was that it was broadcast live from an immense circus tent – the largest in Europe. It was rigged with expensive electronic novelties such as motion controlled lighting and a video wall. Every week the tent was set up somewhere else in the Netherlands, which was no easy feat in extraordinarily cold winters. Because Sterrenshow was so difficult to produce, the show could not run for an entire season. VARA decided to fill the gap in their programming schedule with another lotto show called Mid Lotto Live. The look and feel of this show had to be sufficiently different from both VARA’s own Sterrenshow and competitor KRO’s 1-2-3-show. To that end, VARA chose new media technology as leading concept for Mid Lotto Live. Jan Willem Doorenbos was asked to coordinate these new media technologies. Doorenbos told us that he had written about new technology as a journalist and had just started working as a television producer, when VARA approached him for Mid Lotto Live. He had already decided on some new media elements when he made his obligatory visits to the NOS departments for set design and graphic design. Doorenbos wanted the set for Mid Lotto Live, as can be seen in figure 6, to feature a giant video wall on which the games were played. The scores were kept and displayed via a computer and the show’s host had a robot assistant. To balance out the high-tech elements, the show host’s second assistant was a dog and the set designer placed a large classical statue in the modern, minimalistic set of palisades, video wall and perspex. Because of the new media technology concept, Doorenbos wanted the title sequence to be made with the most advanced computer animation software available. He had interviewed astronomer Seth Shostak not long before and knew about his work in 3D computer animation. Shostak at that time, worked at the University of Groningen, in the north-east of the Netherlands and he had produced several short educational films and animations explaining astronomical phenomena. While working on a film about the expansion of the universe, he could not figure out how to do it with conventional animation techniques. This inspired him to try and use the computer at the university that he used to interpret radio-telescopic data. Shostak and his colleague Bart Wevers wrote the software for this themselves. Like public television, the university was also facing cutbacks which inspired Shostak and Wevers to seek commercial exploitation of their computers and software. They named their company DIGIMA (Van der Plas, 1986, pp. 16-17). DIGIMA had hardly any overhead costs as the computer and offices were already paid for by the university and students helped out as operators. Because the software was written by Shostak and Wevers themselves, it could be customised to a great extent. However, Groningen was far away from television producers and other media-oriented clients. Also, DIGIMA had no facilities for video recording and editing (instead they recorded from the screen on 16mm celluloid). Moreover, the machines were only available at night, because during the day they were used by the university (Van der Plas, 1986, p. 17). Despite these disadvantages, Doorenbos was determined to work with DIGIMA which he considered the best 3D computer design facility in the Netherlands. At his visit to NOS GD Doorenbos was introduced to Delbosq who was an obvious choice for this project. Delbosq came up with the idea of placing the show host inside a lotto carousel with lotto balls flying all around him. He went to Groningen and collaborated with Shostak and other operators at DIGIMA on creating a 3D animation of lotto balls. Doorenbos recalls: “At some point in the very long process, I found the operators and the designer deadlocked. Delbosq wanted the lotto balls to move randomly through space, like they would in a lotto carousel. But the computer didn’t understand random. There was a considerable barrier in communication” (Van Vilsteren & Doeswijk, 2011, p. 123). Animator Tony Kluck, who often freelanced on animation jobs for NOS GD, had to come and help out in storyboarding the exact movement paths of the lotto balls so that the operators knew what input to give their software. After the 3D computer animation was complete, it had to be combined with live action footage of the show host and the logos of VARA and the show. This was done at Antics Studio Amsterdam. The whole production process was long and exhausting, both Doorenbos and Delbosq recall, everything was trial and error and had to be improvised on the spot. 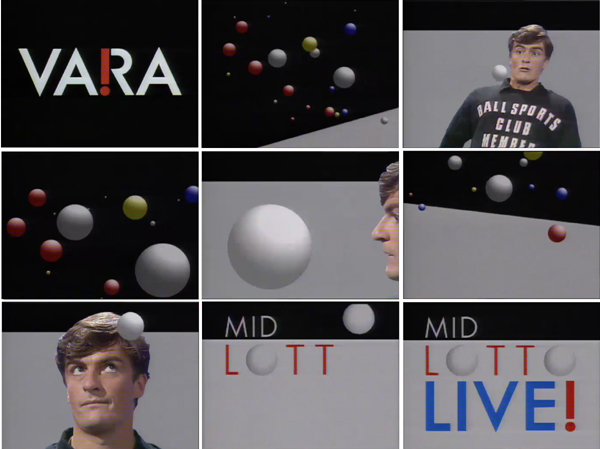 Figure 7 gives an impression of the resulting title sequence for Mid Lotto Live. The sequence starts with the VARA logo (designed by Frans Lasès of NOS GD in 1983) on a black background. This flat image is suddenly made 3D as the point of view changes and we are in a dark space with a horizon that is sometimes far, sometimes near, straight or tilted and where red, yellow, blue and grey balls move seemingly at random. These scenes are cut with show host Johnny Kraaykamp who stands in front of the light grey horizon and tries to avoid being hit by balls. The print on his sweater reads: Ball sports club member. The sequence ends when two of the grey balls find their spot among the letters that spell the title of the show. When they do, the image is 2D again. In light of the difficulties in the production process it is surprising to note that the title sequence in fact does not look all that high-tech. In fact, if Tony Kluck had animated the lotto balls the old fashioned way he could have created a similar result. Similarly, the operators/designers at Antics Studio Amsterdam were capable of creating 2D animation that looked convincingly like 3D animation and at Antics Studio this would have likely been a smooth production process since, unlike DIGIMA, they were set up as a commercial audiovisual facility and employed operators with a design education. But working with the latest digital media technology had been the goal from the outset and creating 3D animation was such a milestone in itself, that Doorenbos and Delbosq felt that all efforts were justified. As mentioned above, VARA was undecided when it came to adapting to the changes in the media landscape. In broadcasting shows like Sterrenshow and Mid Lotto Live they followed Veronica’s lead, a decision that many at VARA disagreed with. The designers at NOS GD were also discontented with this direction and knew about the internal struggles at the organisation. When Frans Lasès, one of the designers at NOS GD, was asked to design a new VARA logo in 1983, he was wary. He remembers thinking to himself: “I won’t do it. I’m not entering that hornet’s nest… I knew what was going on, they wanted to go in the Veronica direction, socialism be damned. They were selling their soul”. His new design for the VARA logo and accompanying house-style (as seen top left in figure 7) went in the opposite direction. Lasès used the red exclamation mark to remind VARA of their activist socialist past, and the flat, graphic black and white style as a reaction to the trend of shiny, 3D flying logos. So, in terms of their focus on lotto shows and entertainment VARA seemed to followed Veronica, but their house-style did the opposite. The Mid Lotto Live title sequence is a reflection of this split. On the one hand, the sequence is a high-tech 3D computer design ‒ highlighted by the transitions from 2D to 3D and vice versa at the start and end of the sequence ‒ a feature that was chosen deliberately to attract attention to the show in the competitive broadcasting system. On the other hand, it also sticks to the sober nature of the house-style as designed by Frans Lasès, mentioned in the previous paragraph. Except for the dark horizon, there are no science-fiction or space references, only primary colours and the lotto balls have a matte surface instead of the shiny glow of the typical 3D flying logos. It seems as though Delbosq eliminated any elements that would seem like VARA was jumping on Veronica’s band-wagon. The sequence had to appeal to both the audiences seeking entertainment, but similarity not repel more “serious” audiences either. The title sequence for Mid Lotto Live is a balancing act that represents the predicament VARA was in. Pioneering digital animation and graphic design studios such as Antics Studio and DIGIMA profited from the declining monopoly of NOS over the television production market and the willingness of broadcasting organisations to invest in computer-aided design as a means to distinguish themselves in a highly competitive public broadcasting system. But their head start was also a handicap. Antics Studio had trouble making enough return on investments. DIGIMA was really more of a side-project for Shostak and Wevers and was never really commercially profitable. The opening of the television production market had spurred many new computer production facilities that were offering very competitive prices for broadcasting organisations. Some of these new companies offered only a few very specific digital effects, others could provide a complete package; from design to finished title sequence or station call. On top of that, new computers and software packages were being introduced and updated almost on a monthly basis. These new Amigas, Macintoshes, Quantels and Cubicomps and their graphic software delivered excellent results, were less expensive and easier to operate compared to the soft- and hardware at Antics Studio and DIGIMA. After only two years of operation Antics Studio Amsterdam was declared bankrupt in 1986. DIGIMA gradually evolved into an educational institute for computer animation in the late 1980s (Visser, 1988). By the end of the decade, the competition in the production market and the competition amongst broadcasters was given a new impulse when the first commercial station, RTL 4, started broadcasting for Dutch audiences. Shortly after its start in 1989, RTL – a company officially based in Luxembourg to circumvent the Dutch media laws – managed to pocket half of the television audience. The competing public organisations now shared a common enemy with a recognisable face. RTL 4 presented itself on-screen using flying, shimmering golden 3D letters, much in the style of Veronica’s scanimate station calls of the early 1980s. Interestingly enough, it was Willem van den Berg who was responsible for the RTL4 station identity. Meanwhile, Carlo Delbosq continued trying to apply the latest 3D computer techniques in a sophisticated ways for broadcasters like KRO and NOS. He integrated flying logos in well thought-out design concepts and tried to minimise their lowbrow associations, for instance, by adding a classical orchestrated score and combining 3D computer graphics with live action footage. However, RTL 4’s heavy use of flying logos stigmatised the 3D style. By the mid 1990s public broadcasting organisations all desired graphic styles, natural references and life action footage for their station calls and title sequences. Even Veronica stopped using their 3D logo in 1994. The flying logo became a rarity on the public channels. In this research study we examined several examples of station calls and title animations made with the help of a computer or made to look like they had been made on a computer. The conditions in which they were created differed: some designers experienced great creative freedom, others had to walk a tightrope between opposing forces, one example did not even involve a designer to begin with. Sometimes the production process was long and tiresome, in other cases it lasted only a few hours. In some cases budgets were modest, in others less so. But there are similarities too. In the early 1980s Veronica, VPRO, NOS and VARA all wanted their audiences to know that they were using computers for their station calls or title sequences. Each broadcaster had its own motives for wanting to associate itself with new technology. Veronica, VPRO and NOS tried to appeal to young audiences by referencing visual tropes from science fiction and video games. VARA aimed to reach a milestone by claiming the first 3D animation on Dutch television. They all desired the associations, like the future, youth and speed, that the computer represented. Likewise, designers each had their own practical and aesthetic agenda when it came to using this new technology and dealing with its limitations. As the machines used for animation, editing and graphic design became more advanced by the mid 1980s, the computer became the means to an end, rather than an end in itself. Styles that were associated with the early 1980s were dismissed and the 3D flying logo became exemplary “bad” design: design that was created by computers rather than designers. To be fair, not all of the designs discussed in this research study are to be remembered as examples of “good” design: some lack connection in form and function, others do not stand the test of time (and, for example, we can see their technical imperfections). Still the stories behind their making – set in a period of transformation – show how any design project is influenced by the financial, political and technological context in which it is developed. Transitional periods such as the early 1980s in the Netherlands offer good examples in this respect. In fact, the Dutch situation is an exceptionally fruitful context to examine developments in design. In the Dutch broadcasting system, with all its different broadcasting organisations, a large amount and wide variety of identities need to be visualised. New technologies and trends are therefore rapidly tested, implemented and discarded. This research study has shown only a few examples, but there are many more fascinating design stories from this and other periods in Dutch television history that are worth further exploration. For example, VARA’s history is full of struggles around design that illustrate the incongruity between democratic organisations and expectations regarding house-style. Also, much is still unknown about the earliest years of motion graphic design for television. Alas, historic research into audiovisual design is difficult, primarily because of the many issues concerning the preservation of audiovisual media. Audiovisual collections contain little to no elements of the audiovisual identity of broadcasters from the 1950s to 1980s, making it hard to find out what their logos and station calls looked like, how they evolved over time and what techniques were used to create motion. Even if a station call is salvaged from a consumer videotape it’s difficult to find out when and how often the call was used and how it corresponded to other continuity elements or title sequences for programmes. Furthermore, there is little remaining documentation. After NOS GD became a private design firm in 1988, it slowly spiralled out of existence. Many designers took the offer of early retirement, others like Carlo Delbosq founded their own companies. The slimmed-down firm was sold and moved several times, and the company archive didn’t survive. Fortunately, we have been able to interview designers, design managers and other key figures, and we thank them sincerely for the willingness to share their experiences. Their stories are a crucial source for further explorations into the history of broadcast design. Antics Workshop. (n.d.). Alan Kitching: A Biography. In antics1.demon.co.uk [website]. Retrieved from http://www.antics1.demon.co.uk/ATK_biog.html (last accessed September 15, 2016). Bank, J. (1994). Televisie verenigt en verdeelt Nederland. In H. Wijfjes (Ed), Omroep in Nederland (pp. 76-102). Zwolle: Waanders. Dekker, P. (1981, March). Artikel 25 en de status van het facilitair bedrijf. Film en Televisie Maker, 205, 4-5. Dekker, P. (1982, June). De VPRO-leaders van Willem van den Berg. Film en Televisie Maker, 219, 18-19. Haks, F., & Stolk, S. (1979). De VARA haan. 2 jaar vormgeving en presentatie van Swip Stolk + Rene Coelho m.m.v. Wim Giesbers producties. Exhibition catalogue. Groningen: Groninger Museum. Hogenkamp, B. (2015). De Nederlandse documentairefilm 1965-1990. De ontwikkeling van een filmgenre in het televisietijdperk. Amsterdam: Boom. Holman, Dave. (n.d.). Me Memoirs. In Scanimate.zfx.com [website]. Retrieved from http://scanimate.zfx.com/holman1.html (last accessed September 15, 2016). Koenders, R., & Van Spall, B. (2011). Goedenavond dames en heren: gezichten van de Nederlandse omroep. Baarn: Marmer en Nederlands Instituut voor Beeld en Geluid. Manschot, B. (1994). Televisie en amusement. In H. Wijfjes (Ed), Omroep in Nederland (pp. 176-204). Zwolle: Waanders. Ministerie van WVC (1983, August 29). Medianota 1983 [provisional policy memorandum], No. 18035. The Hague. Retrieved from http:www.statengeneraaldigitaal.nl (last accessed September 15, 2016). Ruarus, P. (1985, September 4). Jaap Drupsteen; een bewogen relatie met beeld en geluid. Graficus, 36, 8-12. Sieg, D. (1998, August). Scanimation in the Analog days. Siggraph 98 History Project, 32, 3. Retrieved from http://www.siggraph.org/publications/newsletter/v32n3/contributions/sieg.html (last accessed September 15, 2016). Van der Plas, W. (1986, September). G.S. Shostak van Digima. Computeranimatie in het noorden. Film en Televisie Maker, 264, 14-19. Van Vilsteren, R., & Doeswijk, L. (2011). Vorm van vermaak. 60 jaar televisievormgeving in Nederland. Amsterdam: L.J. Veen. Van Vree, F. (1994). Massacultuur en Media. In H. Wijfjes (Ed. ), Omroep in Nederland (pp. 14-39). Zwolle: Waanders. Van der Windt, H. (2012, October 27). Unesco werelddag voor audiovisueel erfgoed. In Beeld en Geluid Collecties Blog [blog]. Retrieved from https://www.beeldengeluid.nl/blogs/collecties/201210/unesco-werelddag-voor-audiovisueel-erfgoed (last accessed September 15, 2016). Visser, F. (1988, June 3). Stichting Computeranimatie SCAN begint met symposium en opleiding. Nieuwsblad van het Noorden, 16. Wijfjes, H. (2009). VARA. Biografie van een omroep. Amsterdam: Boom. Liselotte Doeswijk is an independent media historian with a special interest in design. She graduated in Film and television studies at the University of Amsterdam in 2006. She co-wrote Vorm van vermaak, a book about design for Dutch television (2010, with Roy van Vilsteren. Amsterdam: L.J. Veen) and she blogs about audiovisual design on the website Vormvanvermaak.nl. Currently she is writing a book on the history of set design for Dutch television. The research for this book is partially funded by the Mondriaan Foundation. In the future Doeswijk plans to do more research into the history of computer aided design in the broadcasting sector. René Koenders is a video producer, author and personal coach. He studied Film and television at Utrecht University. He worked as researcher and editor at the Netherlands Institute for Sound and Vision, where he coordinated and co-authored a book on Dutch television announcers in 2011 (Goedenavond dames en heren. Baarn: Marmer). He also helped set up the Beeldengeluidwiki.nl website in 2007. He was chief editor of that platform from 2008 until 2014.